This Friday, 31 October, is the very first World Cities Day promoted by UN-Habitat! This years theme is "Leading Urban Transformations". Leading urban transformation is about redefining the urban paradigm for future generations. It is about empowering people to contribute to creative solutions that can improve our shared urban future. It is about innovation and new ideas to bring about the city we need and the future we want. City Space Architecture will be part of the event with the seminar "Life in Cities | Conversazioni sullo spazio pubblico", on urban transformation, urbanity and public space. The seminar is organized in collaboration with the Emilia-Romagna Region and will be held in Bologna at the Esprit Nouveau Pavilion, Fiera District. It will bring together public administrators, academic professors, professionals, artists and citizens, exchanging ideas and reflecting upon projects, experiences, research and practices, comparing different points of view and multidisciplinary approaches. The seminar will be also dedicated to the presentation of the international research project "MaPS. Mastering Public Space". MaPS is a three-years term project intended to investigate relevant cities and geographical contexts, all around the world, through a large network of scholars devoted to urban and architectural studies. In addition, the seminar will include the presentation and exhibition of the photographic research "Pop-up City" developed by Fabio Mantovani and curated by Luisa Bravo, that was exhibited for the first time at the Museum of the History of Bologna, June 27-July 20, 2014. "Pop-up City" was presented on September 1-3, 2014, at the "Future of Places" conference in Buenos Aires, Argentina, promoted by UN-Habitat, Project for Public Spaces and Ax:son Johnson Foundation. 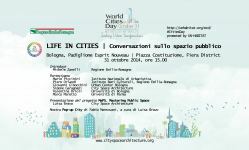 The seminar "Life in Cities" is officially registered on the UN-Habitat World Cities Day website. To read the program of the event, click on the image on top left. World Cities Day was established on 27 December 2013 by the General Assembly in it’s resolution A/RES/68/239, in which the General Assembly "decides to designate 31 October, beginning in 2014, as World Cities Day, invites States, the United Nations system, in particular UN-Habitat, relevant international organizations, civil society and all relevant stakeholders to observe and raise awareness of the Day". The first World Cities Day to be commemorated on 31 October 2014 will be hosted by Shanghai Municipality, in the People’s Republic of China. "On 31 October this year, for the first time ever, the world will celebrate World Cities Day. This is in recognition of the increasingly important role cities play as we move into a predominantly urban future". Watch the full statement of UN-Habitat's Executive Director, Dr. Joan Clos, on UN-Habitat's youtube channel. This entry was posted on October 28, 2014 at 12:27 pm. 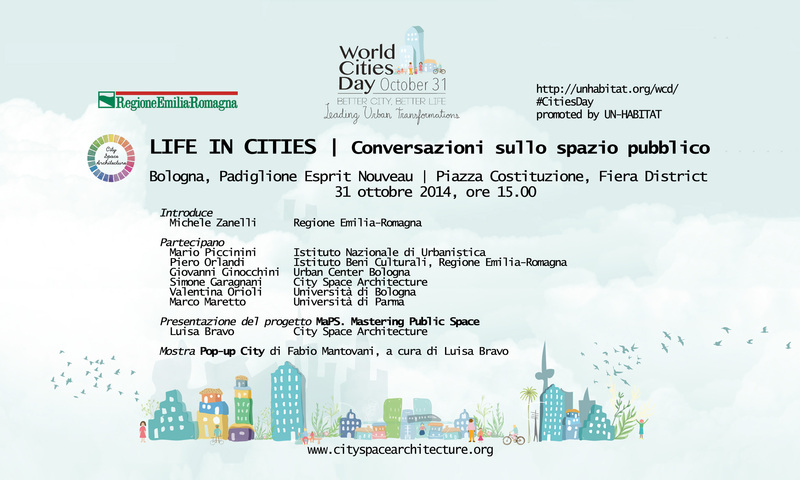 No Responses to "Life in Cities | Conversazioni sullo spazio pubblico"